There isn’t anything more pleasurable than listening to the giggles and laughter of your little one as he enjoys bouncing up and down in his best baby jumper. It is simply amazing how a baby loves a jumper at such a tender age. There are two varieties of jumpers available. A traditional jumper has straps that clamp to the doorway, whereas stationary jumpers have a built-in structure with straps that attach themselves to the built-in rods. It needs to be noted that if your house has unusual features or wide molding, traditional jumpers may not be the right choice for you. Doorway jumpers on the other hand, take less space but can be inconvenient if that is a popular doorway inside your home. On the contrary, a stationary jumper can be placed anywhere within the house. Irrespective of the type of jumper, both designs require the baby’s neck to be stable before they use a jumper. Generally, toddlers love jumpers and this baby product is mostly used between six months to twelve months of age. Disney Baby MINNIE MOUSE PeekABoo Yes Up to 96 hours 24.2 lbs. 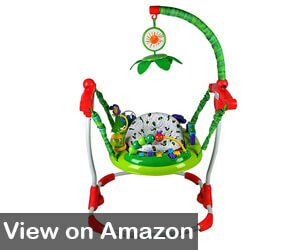 Baby Einstein Activity Jumper Special Edition Yes Up to 20 hours 25 lbs. 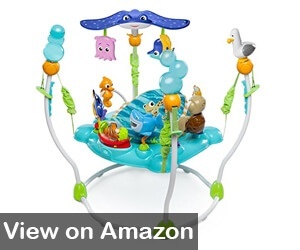 Baby Einstein Neptune’s Ocean Yes Up to 35 hours 24.2 lbs. Jolly Jumper – Stand for Jumpers and Rockers No N/A 28 lbs. Creative Baby Eric Carle Yes Up to 50 hours 25 lbs. 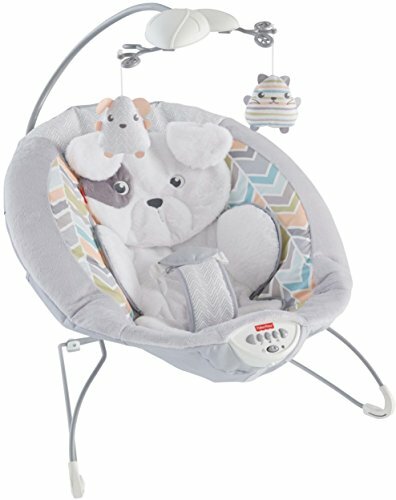 Fisher-Price Discover ‘n Grow Jumperoo Yes Up to 20 hours 25 lbs. Disney Baby Finding Nemo Sea Yes Up to 288 hours 25 lbs. This baby jumper is the best deal for your baby girl who can explore and enjoy in this fun and interactive activity jumper. The Minnie Mouse Peek a Boo features 12 interactive activities and toys to keep your baby occupied. 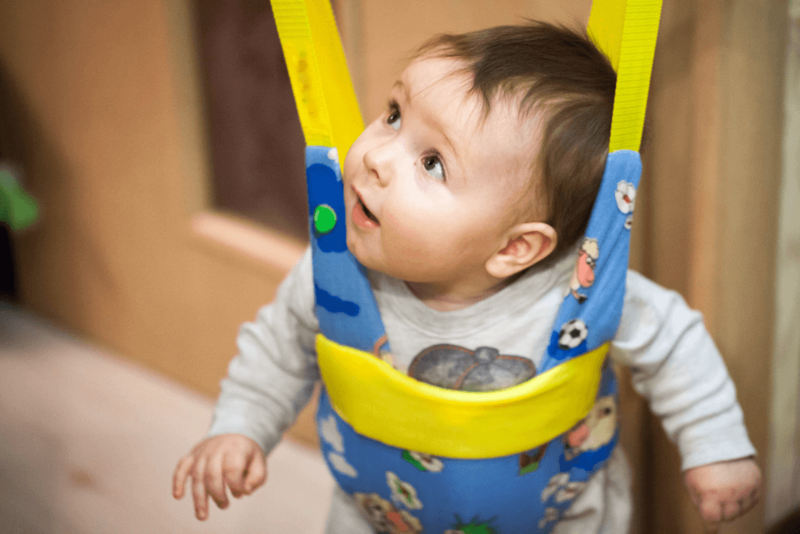 This activity jumper grows with the baby as it has four height adjustment options – parents can easily choose the one that is best suited for their child. 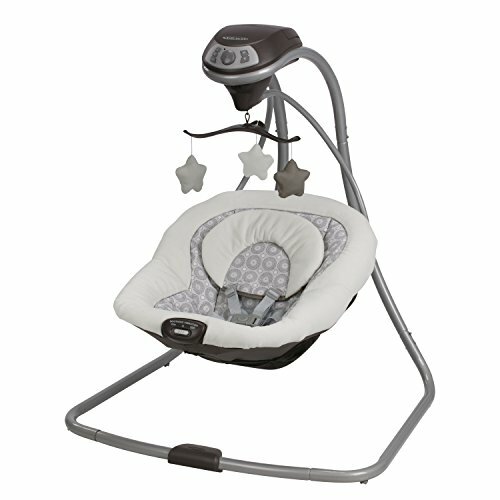 In addition, the Disney Baby Minnie Mouse Activity Jumper also has a 360° rotating seat along with an electronic toy station. 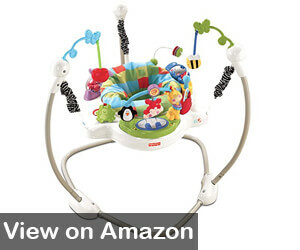 This helps the baby to reach and play with every toy on the activity center while jumping and exploring (source). 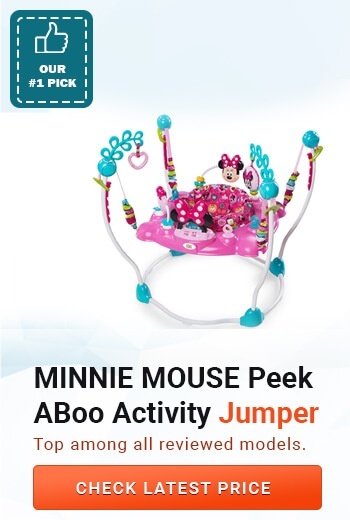 The activity jumper further has Minnie Mouse inspired sounds with volume control option and lights. It comes with a removable loop so that you can keep adding or removing toys as per your preference. 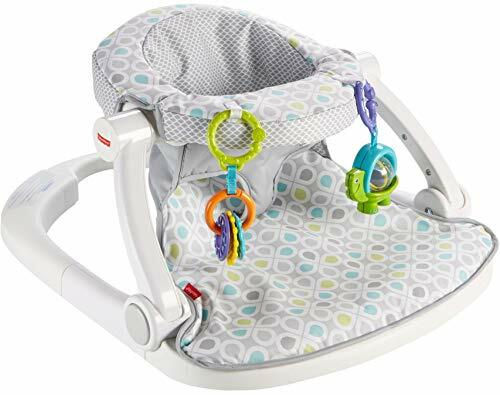 The baby Einstein jumper comes along with an activity center that features numerous toys for your baby’s enjoyment. This special edition jumper also has a rotating seat that moves around in 360° for easier accessibility. 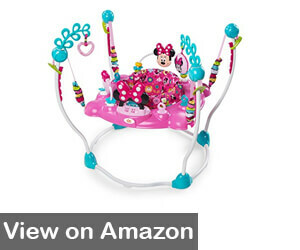 The activity center includes a rattle, drum set with beads, spinning frog bead chaser, and more. The thing that children love the most about this activity jumper is the piano that supports three modes – classical melodies, language discovery, and piano key tones. The piano also has lights and supports three languages including English, French, and Spanish for children’s learning and development. This Baby Einstein Special Edition comes with small side mirrors through which a baby can see him/herself while jumping. There is a tray around the activity center as well that allows parents to either place more toys or small snacks for the child. One of the leading products launched by Baby Einstein is this baby door jumper. It has a unique design and comes with a detachable electronic turtle station. 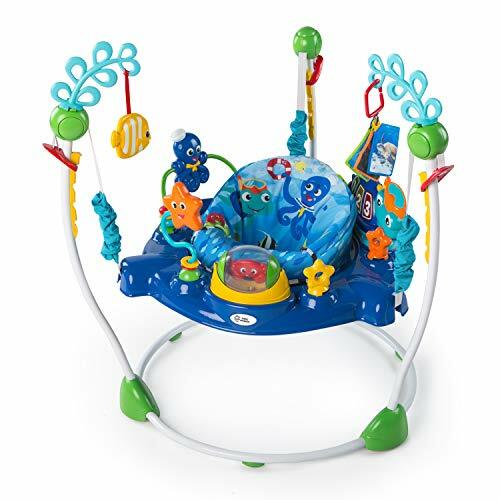 The jumper keeps your child entertained with excellent sounds and lights and a beautiful oceanic theme with fish, octopuses and more! The reason why parents love this product is because it fosters learning and development through entertainment. What’s more is that the jumper also features a 360° rotating seat and four height adjustment options. Another great thing about this jumper is that it supports three different languages including English, French, and Spanish. Your child can learn about colors in different languages. The only downside is that it is not portable, which means that it cannot be folded for easy transportation or storage. Parents will have to disassemble the product for storing or carrying purposes. 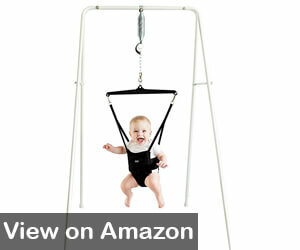 This baby activity jumper is one that hangs down from a steel frame by a spring. The Jolly Jumper offers a saddle seat that provides unprecedented support to the baby’s spine. The seat ensures that the baby’s posture is upright even during vigorous exercise sessions.One of the few downsides is that the steel frame isn’t robust. This means that the jumper needs to be fastened into the doorway. Thereby, the jumpers cannot be used outdoors and that restricts your child’s playtime to indoors. Also, there are no bells and whistles, so your child might get bored faster than in some other models. The steel frame might not be sturdy for heavier babies and would need extra securing to a doorframe. There are no bells and whistles with this jumper, therefore a baby might become bored faster than other models. If we talk about the most versatile baby walker jumper available on the market, this has to be it! Inspired by a book named ‘The Very Hungry Caterpillar,’ this activity jumper is ideal for all types of babies and comes with multiple options for your baby to play with. 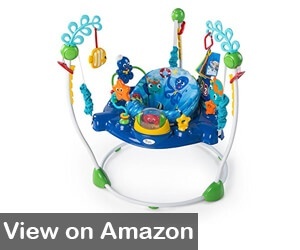 The jumper features an activity station with fancy lights, flipbook, five classical melodies and fun toys. In addition to this, the product is highly durable and the firm structure ensures safety of the toddler no matter how high they jump. Another plus side, with the materials used, this jumper is sturdy without being too heavy. It is lightweight and portable so that you can easily store or move it without any hassle. This stationary baby jumper is ideal for those babies who are unable to walk or climb yet. As long as they can hold up their head unassisted, they would love the Discover ‘n Grow Jumperoo. The product is well designed, compact, user friendly, safe, and most importantly FUN! It comes with a swivel seat that rotates 360° to keep your child entertained. With this, they have access to all the toys and other functions to keep themselves occupied. Apart from this, it is easy to maintain as the seat is removable and machine-washable. 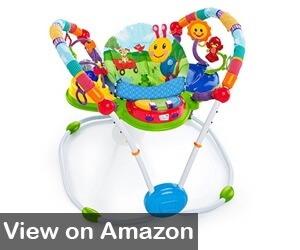 The activity jumper features lights, toys, and music giving babies ample options to play with. The product offers greater value for those parents who are looking to prepare their babies for standing and walking. The only downside is that it covers too much space and is not portable. If we talk about entertainment, this cheap baby jumper certainly exceeded the expectations of my children. The activity jumper also includes a play mat which can be placed under the feet of your child. The play mat is typically used as a shock absorber. Disney Baby Finding Nemo jumper is highly durable and sturdy due to which it stays at one place while your child jumps and enjoy without any worry. There are different types of products that your little one will need over the passage of time. Investing in a baby jumper is a smart choice as it will keep your baby occupied for at least four to six months. Moreover, they also help in improving your toddler’s sensory motor skills. While these are the primary benefits of a jumper, there are various small benefits that come with purchasing these jumpers. With so many options available in the market, you can pretty much find anything for any range of budget you may have. Moreover, all these jumpers are safe and mothers can take comfort in knowing their baby can keep themselves entertained during their time in the jumper. While jumpers are primarily a source of entertainment, they also improve learning and stimulate the toddler. These jumpers clamp to the door frame where a seat is attached to a large, single spring. A few have toys or bumper trays, but they generally do not play music. They do not consume much space when installed and are fairly easy to store. They are also generally more inexpensive in contrast to other jumpers. The only downside is that your home must have the right type of door frame for the unit to hang safely from. These jumpers are similar to the doorway models, but have a seat that is suspended from a swing like frame. Generally, these jumpers do not have any toys, bumpers or music. They consume a lot of space, but are easy to store. Such jumpers have a rotatable seat that is suspended using springs. The jumper has a tray with toys to keep your little one busy. You can play music for your little one and a few models also light up. While these bumpers can be dismantled for storage purposes, they tend to be bulky. A jumper is not just a source if entertainment, rather it features some important developmental attributes. Jumpers are fantastic ways for your child to develop leg muscles, coordination, feet and leg discovery and overall motor skill development (source). Although there are no definitive studies that testify the efficacy of a jumper and their important role in strengthening hip muscles, it is layman observation that they do offer some support and benefit. However, it is advised to use jumpers in moderation as they can put stress on the baby’s muscles due to frequent use. While a jumper is not essentially a walking tool, it can help in developing pre-motor skills that the child requires. It assists in offering support to the lower half of the body enabling them to stand upright and improve limb function. Therefore, not only they are able to stand and balance, but often times you can find your little one dancing to the beat of the music from the unit itself. Jumpers offer comfort to your little one and can also be labeled as a mechanical short-term babysitter while you do nearby chores. Furthermore, they are also a safer alternative to a walker as they don’t move and pose no threat of children falling down the stairs. Depending on the jumper you purchase, they can serve as an activity center or an in house Disneyland. With toys and music, there are a variety of features to keep your toddler entertained and busy. Oh, a jumper can also put your baby to sleep! What a rare and pleasant addition for us mommies. When buying a jumper, you will find models that are simple and monotonous to adventurous and entertaining with a large variety of toys, music and activities. Generally, parents love those jumpers that offer audio or visual stimulation keeping babies busy and entertained. Thereby, parents are mostly interested in those jumpers that have a toy center, are easy to carry and have music and lighting. A jumper is a baby product with various small parts therefore there can be various concerns that parents might have. However, it needs to be understood that no product is perfect and comes with pros and cons. For small infants, rotation of the seat is a problem. Without additional support, short babies have difficulty in touching the ground. Limited music, toys and other stimulators. As a mother, there is nothing more important to me than the safety of my little one. 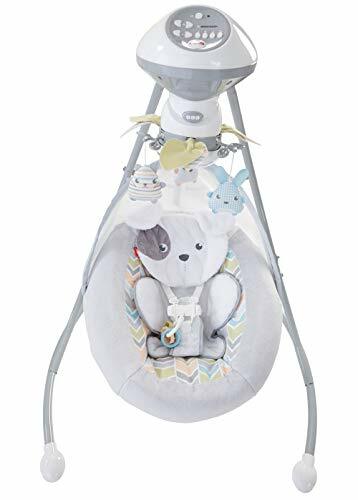 Therefore, after closely examining and experimenting with all these products, I have listed down the best baby jumpers that check all the boxes in terms of price, functionality, compliance and safety. Thus, if you wish to keep your little one entertained, we suggest you buy from my list of the best baby jumpers. Enjoy!